Here is the Double "R"
First, let me make the cardiac disease admission that I have tried nearly every burger in Tucson. Not the ones served at the fast food joints, but those at nearly all the restaurants and grills. Fast food joints rarely cook to order, and I don't like well done. When I dine upon a cheeseburger, I always insist on a double patty cooked medium rare. It has to be slightly bloody. It is simply yummier, and doesn't the creatine get cooked out when the beef turns from red to brown? A man needs to feed his muscles! Additionally, I always skip the onions, and more often than not substitute Cole slaw for fries. I simply despise onions. Skipping the fries makes me feel a little more innocent with respect to cholesterol considerations. Plus, with a pickle, tomatoes, mushrooms, avocados and lettuce which naturally accompany the burger, I really am eating the equivalent of a salad, right? With this said, herein I will not insult any of the other Tucson burgers because so many of them are good, if not great, and I do not desire to make any enemies. Instead, I will praise the R Place Double "R" Burger for its being Tucson's best. In bullet form I list the favorable attributes of this delicacy, with the proviso that the only way for you to truly judge my claim is to taste the burger yourself. the meat. R Place doesn't give you the fatty beef. It is very lean and the cook never fails to keep my double patty pink on the inside. Some pink always stains the bun. Not only this, the beef is always salted just right. the bun. The bun is always fresh and nicely toasted on the inside, then perfectly coated with a thick layer of mayo. the cheese. The Double "R" comes with an abundance of cheese slices, and I think they apply both Swiss and cheddar. What can I say? Cheese is yummy and the more the merrier. the other accouterments. This burger really is layered with just about everything else, bacon, mushrooms, and I believe avocado. I may be missing a few things, and I always forget to take notes because I'm too busy chewing and swallowing. But nevertheless, I'd still call this burger the best in Tucson, even if everything but the bun and the beef patties were omitted. So, in conclusion, I am not a food critic. I am just a guy that loves burgers, especially the double patty ones. 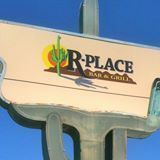 R Place has served me the Double "R" a number of times and it has always been so yummy I could not resist blogging about it today. If you are skeptical the Double "R" is the best burger in Tucson, there is only one way to find out, or you may be missing out! In closing, I want to give thanks to Tom Garcia, Bill Stevenson and Tori. Tom and Bill introduced me to R Place and are so often hanging out there when I get off work ready for supper. Tori gets a special thanks for always putting her hair in pigtails, and for being the most entertaining and cute waitress ever. And of course, all the patrons and other employees, and especially the cook, deserve an honorable mention. Everyone has always been amicable. 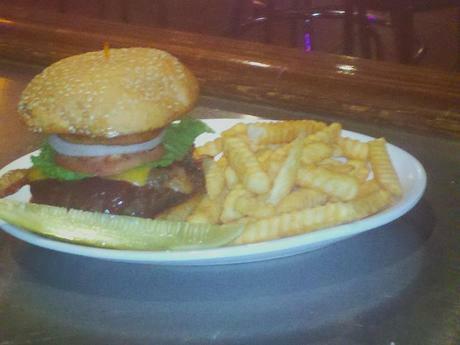 As a postscript, yes, eating this burger is in compliance with the rules of my one meal a day diet!